Kerry's L Prendergast is surrounded by Down defenders as he kicks the ball wide during the Kerry v Down All Ireland Senior Gaelic Football Final, 22nd September 1968. 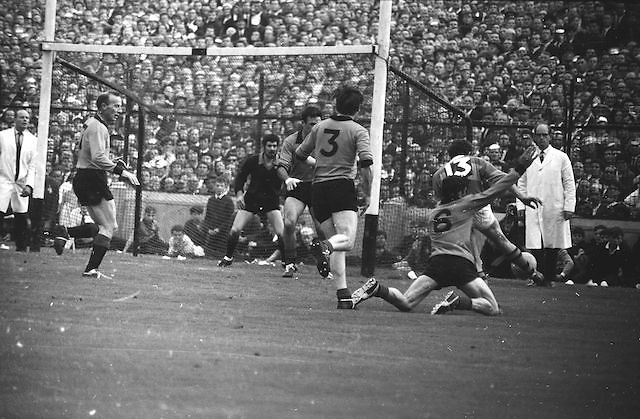 Down defend well as Kerry forward L Prendergast kicks the ball surrounded by Down defenders but ball went wide during the All Ireland Senior Gaelic Football Final Kerry v Down in Croke Park on the 22nd September 1968. Down 2-12 Kerry 1-13.